"Mobile Disco / Wedding Disco"
Mobile discos for all occasions - weddings, birthdays, Christmas parties etc.. With a music library - over 30,000 tracks from the 1950's up to the current chart singles. All the best family party, dance, R&B, Kisstory, party cheese, club classics and romance to help ensure a good night will be had by all. All music request, playlist are welcome before and on the night. We use good quality FBT and Denon sound equipment. 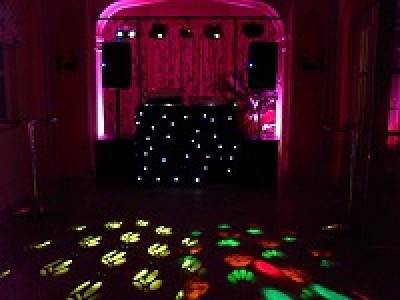 We use upto date lighting which includes 4 overhead gobo LED lights (disco lights which fill the room). A red / green cluster laser for added effect. Starcloth around D.J. stand for neatness and pleasant appearance. We also use up-lighters which can be placed around the room to colour wash the walls to match a colour theme. Required by many venues, DJ Sounds has a current PLI policy with Mobile DJ Network in the amount of £10 million. Also required by many venues, DJ Sounds has supplied satisfactory evidence of holding current PAT inspections of their equipment dated within the last 12 months. A Method Statement, outlining DJ Sounds&apos; Health & Safety procedure for setting up disco equipment has not been supplied. Why do people choose to book DJ Sounds? Value for money. Fulfilled our requirements and is happy to go with play list. Reviews indicated experience at this kind of event, sensitive about sound levels and guests wanting to talk, reasonable quote. "very pleased with David, he did a great job, everyone enjoyed the musice it was perfect for my birthday,"
"Could not fault him. So many of the guests at the party commented on how good he was "
"David was absolutely fantastic at our wedding reception, from booking him to the night of our reception David was helpful , nothing was too much trouble , real pleasant guy to deal with and fully recommend him "
"oh What a good evening . DJ was spot on with the music I had requested. He kept the party going , the dancing never stopped . Terrific job. And so professional. Well done you made a good party a brilliant one, all the guests said best party ever . Thank you . " "Really good, thank you. Will definitely book again next year." "Brilliant from start to finish,music for all generations. Everyone quoted how good the music and dj was Thankyou!" "We recommend this DJ, we all go a great night and the feed back from other party goers was excellent. The lightning system exceeded our expectations and the music was perfect, the price was very competitive and service professional throughout. Thank you again Dave for a fantastic night and smooth service. " "Dave was fantastic! The music choice was superb, everyone had a fab time! Would definitely recommend him and would use him again! Just outstanding! " "An absolute professional, very friendly and helpful, and read the room well. will definitely use again "
"Dave is a lovely fella and dealt with the surprise very well. Extremely accomodating to a last minute addition of a singer. Lights and sound were fantastic, will definitely consider Dave for future events "
"prefect night, everybody had a great time and were able to enjoy the music and also able to catch up with each other without having to shout to make one heard easily recommend for future"
"Fantastic customer service. Dave and Jackie quoted a very competitive rate, were very prompt in answering my queries, arrived early on the night to make sure everything went smoothly and was set up well in advance, were very happy to play requests on the night and do announcements when asked. I would definitely recommend them, and ask Dave again if I was in need of a DJ! " "Pleased he was able to organise at very short notice." "We will definitely be using him again at future events. Excellent value for money, professional, friendly and would highly recommend. " "Good service all round and good music. " "Very happy with DJ Sounds. David arrived in plenty of time to set up the room. Excellent range of music and he accommodated our special requests. I'd use DJ Sounds again and recommend David to anyone." "Great DJ will definitely be booking again." "Very happy with Dave as DJ. Dance floor full all evening"
"I would highly recommend DJ Sounds (Dave and Jackie) they turned up on time, they played the songs we asked for, were right with their sound levels, and did not talk over the songs which was lovely. Great value for money. " "Great DJ. Daves music everyone enjoyed would use his services again . " "Great job, no complaints, professional and would recommend. " "Dave was very good, played the perfect playlist for the night and we had a superb night. Thank you"
"Dave was excellent on the night played all the pre booked tunes as requested and hand selected excellent music which had people up dancing all night , even tried to book again in August but unfortunately was fully booked , not surprising he was excellent . Thanks Dave "
"The music played was suitable for all ages, and made the evening a great success." "This Dj was brilliant. Extremely helpful before and during the party. Great value for money. Would definitely use again and recommend"
"Brilliant DJ no complaints at all "
"Very happy with the show and music selection will definatley recommend to others"
"Very professional. All equipment worked and sounded just right. We had a few music requests to give an idea of what type of music we wanted and from that the playlist made for the event was absolutely great! Everything was exactly how we would have wanted. Provided excellent value for money and definitely helped to make our day special. I would 100% use again. Thanks Dave!" "Had my party last night and had fab time helped by excellent music provided by Dave. Everyone enjoyed it and I would definitely recommend and use again"
"Thank you so much to DJ Sounds for providing a fantastic 80s disco for our wedding. David was excellent, friendly and my guests have said how much they loved the song choices. I would definitely recommend DJ Sounds and use them again if I needed a disco. Angie & Paul x"
"The music was excellent and we will definitely be using them again!" "We were really impressed, Dave was a nice guy and had my guests dancing all evening. I would highly recommend his services and will definitely use him again in future." "Fantastic service provided. Would definitely use again and highly recommended"
"DJ Sounds (Dave and Jackie) were absoloutly excellent for my wifes suprise 50th Party,we had a wide range of age groups and the DJ catered for all.His equipment was impressive and with the light system he used we thought were in a club aqnd not a school hall. Myself and family would reommend DJ Sounds to anyone." "Excellent DJ and service, wholeheartedly recomend." "DJ sounds were great! Good value for money and really good fun! Had a great time! Thank you"
"Absolutely amazing. Couldn't have gone any better an timing was perfect. Very professional. An will defiantly recommend. 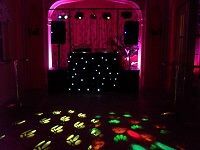 Thank you"
"Absolutely fantastic well worth the money very reasonable price and everyone said how good they were"
"Dj Dave of dj sounds was excellent djing at my wife;s 40th birthday. Email comms were excellent and a playlist was accepted and used on the night. Requests were also taken on the night. Good value for money and he kept the floor filled all night!" " I would recommend this dj highly he was excellent at my party . Very pleased"
"Very good - have booked again already!" Please note that needadisco.com has no editorial control over these images which are stored on flickr.com. If you have any concerns about what you see below, for example potential copyright infringement or unsuitable content, you should take this up with DJ Sounds directly using the Contact section below, or else you may alert flickr.com directly quoting "set number 72157706342457735". If you are contacting DJ Sounds about an event, it's always a good idea to include the DATE, LOCATION, EVENT TYPE, AGE GROUP and TIMINGS to speed things up!